Want to win a huge lot of Digimon cards? 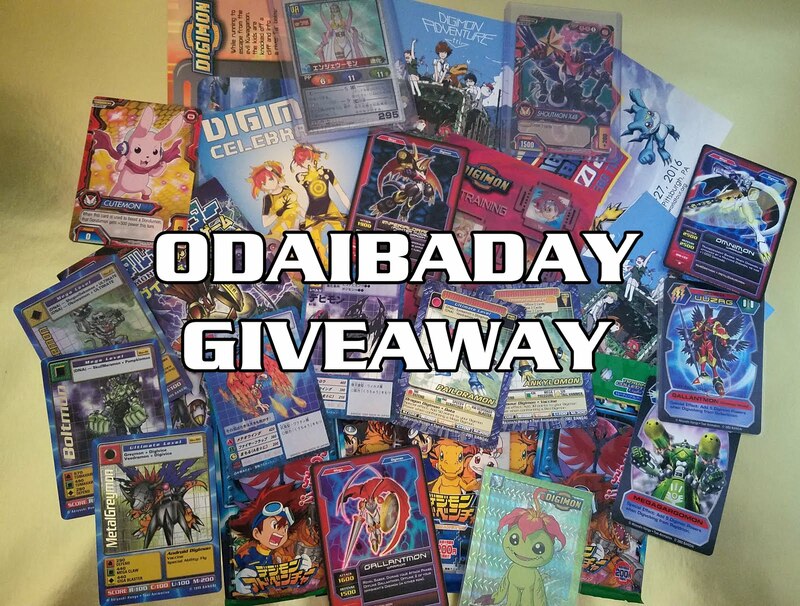 To celebrate Odaiba Day, honoring the day the Digi-Destined first traveled to the Digital World, I am running a bunch of giveaways! To win all the cards seen above, and more, all you have to do is subscribe for my e-mail list and comment below. Tell me your favorite Digimon memories, or what kinds of cards you hope you win, or just say "I hope I win!" The cards included in this giveaway range from almost every US Digimon card series and many from Japan, whatever I could get my hands on. So hurry up and enter now! I am also hosting other giveaways, for different prices, on Facebook, Twitter, and Instagram! US Residents Only, contests end Sunday. I used to have a shoebox full of digimon cards when I was young. I unfortunately lost them all. I would love to be able to get more. I would love a Lopmon card. My favorite memories is watching the show with my brother. I'd love to win anything! I've been a huge digimon fan for over a decade! I used to watch the original Digimon as a kid. I always loved Patamon but it was even bettr when he finally digivolved to Angemon to beat Devimon. Such a shame he had to sacrifice so much to win. It'd be awesome to win~ :b I grew up watching Tamers not Adventure like most people, but I mainly got into the digimon franchise through the old Playstation games. I still hate World 1, always got Numemon lol. Thanks for the chance! I would love to win those digimon cards! Just subscribed! I loved Digimon so much as a kid, but my parents made me give up watching the show cause I spent way too much time on it haha. I snuck over to my friends house to watch it sometimes tho, I couldn't resist cause the anime was honestly my favorite. I would love to win more of those bandai Digimon battle card game cards. My roommate and I have been trying to collect them for the better part of a decade. I see a veemon card in the background! Digimon was so influential to me as a child, and after rewatching the animes as an adult, it has inspired me to never give up on my dreams and become a better person.